Going vegan seems like a big trend right now as we look at our calorie intake and our environmental impact. I never thought eggs were such a big deal because nothing was slaughtered to get them. But, some people can't digest them and some can't forget that the egg could have been a chick. Also, since eggs are the product of animals - it takes more energy to make them then a plant based food. On the other hand, eggs are nutritious and one of my personal favorites for breakfast. I simply love soft boiled eggs see: Why Don't Americans Serve Eggs Like This?. How about a plant based food that mimics eggs? Will that work? Ummm, well, I wasn't really sure until I attempted a "tofu scramble" because I thought that tofu was just for hippies. A whole bunch of you are about to stop reading this post because I mentioned TOFU. Please hang in there and give this a chance. Tofu is just a soybean "cheese" and it is sitting in your major supermarket chain right now! On its own, tofu tastes bland and isn't very yummy. Kinda like chicken, you need to flavor it to make it pop. Flavoring it is simple and it takes almost zero time to cook. You can just eat it raw so it is a matter of getting to the temperature and consistency you desire. 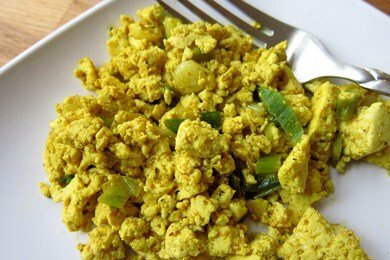 A tofu scramble is almost as simple as an egg scramble. You crumble the tofu, heat it for about 8 minutes, and add spices. What you get is like scrambled eggs except more versatile. For example, would you store scrambled eggs in your fridge to reheat - no! They just get rubbery. But, a tofu scramble can be made ahead and reheated to make a delicious breakfast, lunch, or dinner. This recipe uses extra-firm tofu, cumin, curry powder, and some optional scallions. Do you cook with tofu? Please share! Heat a non-stick pan over medium high heat and spray with non-stick spray. Crumble tofu into pan and add scallions. Heat (stirring often) for 8 minutes until most of the water has steamed out. Mix in the curry powder and cumin. If mixture is too dry add a little water back in to get to desired consistency. Enjoy! We have tried tofu recently and to our surprise we have really enjoyed it! You are right, you just need to dress it up - no different than chicken in that respect. My kids even gobbled it up as if it were chicken - bonus! I really liked this post because there is a ton of versatility with this recipe. We are trying to reduce our meat consumption so the tofu alternative is great and having lots of options is key. Interesting idea. Eggs are the one thing that science,or creative thinking can't replace. I might give it a try. Im not a big meat eater as it is,I view eggs as fair game for vegetarians. An unfertilized egg is not, nor will ever be a chicken. I know very little about tofu. Isn't it a long (read: processed and processed) way from a soy bean to tofu? I have a tofu scramble every morning for breakfast! Mine has black beans and tons of veggies! I am interested in E's question though. I never thought about tofu being a processed food. My mom would make scrambled tofu all the time when I was kid..I'd completely forgotten about it until I read this article! Soy proteins are so good for females, too. Looks like I need to hit up the market and grab some tofu! I like how you used curry to make the tofu look yellow! I will have to disagree with Nova though, they've recently found soy protein doesn't aid in menopause , unfortunately. We just started buying farm fresh eggs. My husband actually has a problem digesting normal eggs but the farm fresh eggs don't give him any problems. It's nice to know that you're supporting local farmers. Not to mention the farm fresh eggs make the best scrambled eggs I've ever had! Eggs are ethically sketchy. First, the chickens endure hardships such as close confinement, debeaking, and questionable feeding practices. In fact, some labels will proudly tout that their chickens are vegetarian fed (as opposed to what, exactly?). The health conscious out there would also point out the immense amount of disease that chickens in close proximity face, and the disgusting way in which the facilities are kept. That being said, I eat eggs, sometimes, but I try my best to be careful about the source. We eat scrambled tofu too and love it! tofu is awesome! I love its versatility. Those who think tofu is bland need to find some better recipes. The soft Mori-nu type is also great to cook with, it makes excellent puddings and smoothies. I love this dish too. but you do not want to eat tofu too much. It is a processed food and not meant to be eaten in large quantities. The only kind of soy you should eat on a regular basis is fermented soy like miso and tempeh. This recipe is great for a great though or if you are vegan. for anyone else grass fed hen eggs are an amazing source of protein and omega fatty acids. They are a super food--great for kids grains and mommies mood and skin. Great recipe, but I agree with Dawn that soy unless fermented shouldn't really be eaten on a regular basis. Most soy products in the American diet are processed and GMO, two things which I would always recommend any client of mine stay away from. Also, if soy is not processed properly, which many store bought varieties aren't, then any health benefits you might reap from soy would be negated because of the anti-nutrients in the soy. Also eggs are good for you. I would say everything should be eaten in moderation, but eggs got a bad rap for a long time for having too much fat and cholesterol, but these actually aren't the real culprits in most of our nations health problems. I don't have any problems with eggs. It was not fertilized and I consider them a gift, not something to shy away from. They are packed with nutrition and are cheap, easy and fantastic. Someone gave me "tofu scrambler" one time and it was the most disgusting thing I had ever tried to eat. One bite was enough for a lifetime. YUCK. Perhaps it was how it was made. I try to stay away from unfermented soy. I've read a lot about it and want nothing to do with it. Unfortunately, it is in practically everything. It kills me that I had to use soy baby formula 16 years ago because my son could not physically nurse. They say it is SO bad for the hormones, etc. Mmm this looks like a good recipe. For those who want to make it themselves, here's a recipe I ran across once. I totally agree with Nicole on the "moderation" bit. There's not much out there that you can eat a ton of every day for months and can claim to be "healthier" at the end...it just doesn't work like that. tofu "chicken nuggets or fingers"
I do not understand why someone would choose a higly processed food made with chemical additives(tofu) over something natural that god gave us(eggs). I run a small free-range egg farm. The health benefits of eggs are amazing. Cholesterol isn't an issue unless you are eating excess amounts of eggs. Additionally eggs that are not fertilized by a rooster have NO CHANCE of ever becoming a chick. Shannon cage free mean they have a coop with a yard attached that is fenced in. They can choose the coop or the yard. Free range means they are loose and can go anywhere they see fit to go!